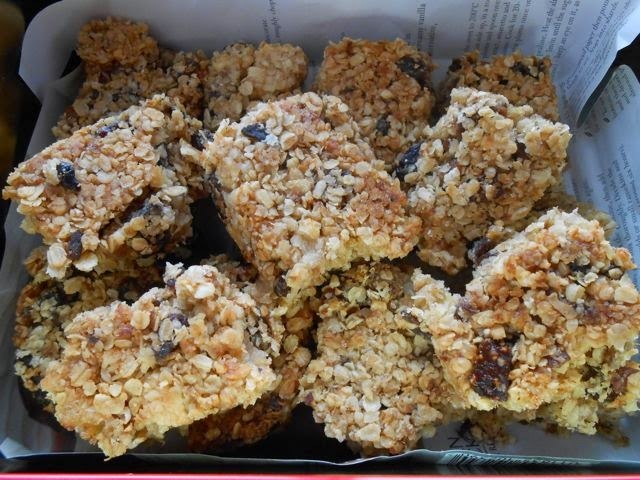 These festive flapjacks are made with honey, apple and mincemeat. They make a good alternative to the ubiquitous mince pie, are great for lunchboxes and they’re also excellent served warm from the oven with custard. Flapjacks are incredibly easy to make and these chocolate mincemeat flapjacks are no exception. It’s pretty much a case of stirring everything together, pressing into a tin and baking. The surprise in these flapjacks are the nubbles of chocolate that come from my homemade mincemeat, along with a gentle hit of chilli. Feel free to try whatever mincemeat you have to hand, but I’ve added a few links to my homemade mincemeat recipes at the bottom of this post in case you feel like trying one of them. Mincemeat is also incredibly easy to make and so much nicer than shop bought. Plus you can add chocolate to it – just saying! Festive flapjacks made with honey, apple and mincemeat. They make a good alternative to mince pies and are excellent served warm from the oven with custard. Melt butter in a pan over gentle heat with the honey. Place sugar and oats into a mixing bowl and stir. Stir in the butter mixture, mincemeat and apple until well combined. Press mixture into a 9″ sq. cake mould and sprinkle with a little demerara sugar. Bake at 180℃ for 25 minutes when the top should be golden and firm to the touch. Leave to cool, then cut into 16 pieces. Thanks for visiting Tin and Thyme. 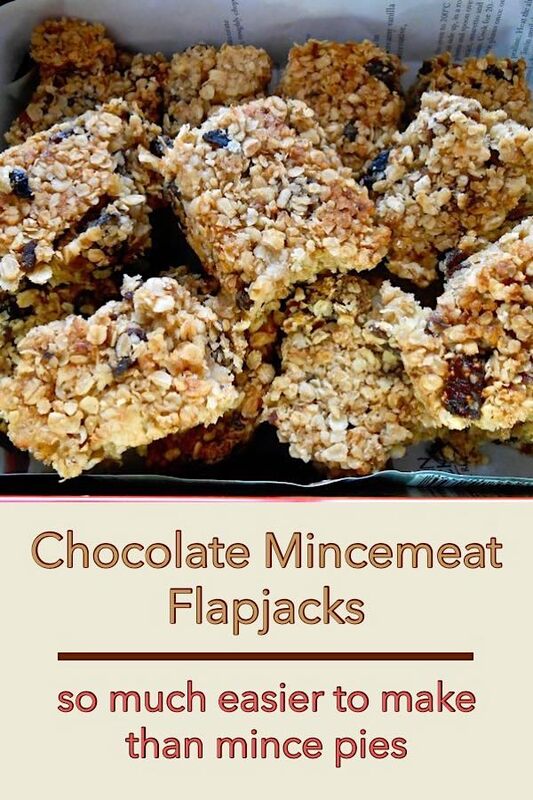 If you make these chocolate mincemeat flapjacks, I’d love to hear about it in the comments below or via social media. Do share photos on social media too and use the hashtag #tinandthyme, so I can spot them. For more delicious and nutritious recipes, follow me on Twitter, Facebook, Instagram or Pinterest. Chocolate Mincemeat Flapjacks. PIN IT. Minicemeat is definitely top of the list of festive treats along with chocolate. These flapjacks look scrumptious! I made some mincemeat flapjacks following Dominic’s “mince pie flapjack” recipe, but subbing in my homemade cherry mincemeat. It’s such a good idea! I really like your apple addition though. Ooh cherry mincemeat sounds good Alicia. Homemade mincemeat is a revelation, even mincemeat hating CT will eat mine. They are so easy and so delicious. 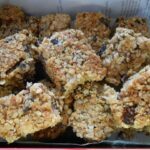 Much as I love a good mince pie, I’m not at all sure I will find the time to make any this year, so these flapjacks are ideal. These sound so good, I bet they are good fresh from the oven with some custard! Lovely bit of chilli too. Haha, I did have one straight from the oven with custard and yes it works brilliantly well Caroline. I love the christmassy touch ou have given these. I’m not really a mince pie fan, but I’d like to try these as they look delicious! Homemade mincemeat is altogether different and might change your mind. What can I say? These look perfection and a great way to use mincemeat. After my recent foray into chilli in flapjack, I am hooked. That ‘little kick’ makes all the difference!! Ooooh, these are super clever – and a good way I suspect to use left over mincemeat too! I love a flapjack or two and these would be just right to sustain me while wandering around in the December cold. Lovely idea and I wish I had some with me right to for morning breakfast ! Happy New Year !